In our everyday interactions, horses always have something new to teach us. If we are actively seeking to further our knowledge of a particular horse discipline, riding in or auditing a clinic is an excellent way to do so. Clinics are usually individual events that last anywhere from one day up to several days and feature a nationally or even internationally known expert in a specific field of riding. Some examples of types of clinics are Cutting, Dressage, Jumping, Driving, De-Spooking, Eventing, Reining, Horsemanship and Trail. In 2010, the High Plains Chapter of the Rocky Mountain Dressage Society brought Dressage trainer, breeder and judge, Hilda Gurney, to 8th Heaven Farms in Castle Rock for a Symposium November 6th and 7th. 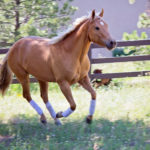 Hilda breeds, rides, and trains out of her Keen Ridge Farm in Moorpark, California and has a long list of achievements, including the an Olympic team bronze medal, and individual gold and silver, and three team gold medals at the Pan American Games, 6 USET National Grand Prix Championships, and 15 USDF Horse of the Year titles. In this recent clinic with Hilda, horse and rider teams were selected from a number of applicants to ride at each of the nine Dressage levels: Training through Grand Prix. The clinic was designed to have Hilda work with each horse and rider team and also include the auditors in the education process. Evergreen resident, Deborah Carter, and her fabulous seventeen-year-old Dutch Warmblood gelding, La Vie Nouveaux, were selected to ride at the Prix St. Georges level. La Vie, by the celebrated Dutch stallion Voltaire, was imported by Deborah from Holland in 2002. La Vie is not only an amazing athlete, with an elegant style all his own, but also a perfect gentleman to be around. Deborah is an accomplished Dressage rider, earning many awards throughout the last 25 years in the sport. She has worked with such top clinicians as Steffen Peters, Debbie McDonald, Axel Steiner, Jan Ebeling, and Peter Borggreve. In 2009, after showing successfully in Prix St. Georges, Deborah and La Vie were schooling Intermediare-1 in preparation for the 2010 show season; however, a tendon injury temporarily sidelined La Vie for the first six months of this year. This clinic with Hilda Gurney was a great way for the pair to get back on track for 2011. In this article, Deborah will help us to look at the benefits of attending clinics, as well as how to choose a clinician. Clinic Benefits – With horses, no matter your length of experience, education or knowledge, there is something new to learn every day. 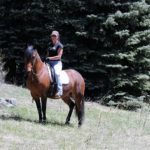 Regarding the riding aspect, Deborah states, “any sport, especially a horse sport, if you are going to be serious and competitive about it, requires that you pursue your education.” That education is really multi-faceted. You have the work and the relationship you build on a daily basis with your horse at home, the foundation that you learn and build upon with your regular trainer, and the specialized knowledge you gain from participation in clinics. Another benefit of going to a clinic is that it helps you and your horse get over ‘stage fright’. Deborah states, “preparation for, and participation in, a clinic setting elevates all of the nerves and performance anxieties of both athletes, so it is almost like going to a show. You have a bigger crowd watching you. More is riding on your performance. It helps you get better at overcoming ‘show nerves’, so your horse doesn’t feel you tensing up when you enter a show ring.” In addition, your horse becomes more accustomed to being in a different environment with new objects, loud speakers, other horses, activity and spectators. Deborah considers working with a local trainer on a consistent basis to be an imperative aspect of an individual’s training program. However, in our region, clinics can be a great complement. 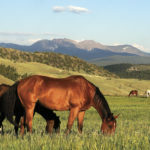 Deborah explains, “Colorado is an interesting place because we don’t have an abundance of local trainers with national or international experience. We have some excellent trainers, and you can get a solid foundation of the basics and what you need to move up the levels with your equine partner if you work with someone with whom you get along and knows your style of riding, your horse’s capabilities, the goals to which you aspire to. But we Dressage riders her in Colorado are blessed with many top visiting clinicians and if you budget for this enhanced learning opportunity, you can increase your education. You can take certain revelations or exercises away from what you learn at a clinic that you then can plug into your work at home and your work with your local trainer. It is really a whole different aspect of your and your horses continuing education.” The key to getting the most benefit out of a clinic is choosing the right clinician for you and your horse. Also consider finding clinicians who come yearly or regularly so they become familiar with you and your horse. They then can develop and understanding of where you are at, how you have progressed, and where you need to go from here. On the other hand, avoid clinicians who ride differently or treat their horses differently than you would want to. Or people who ride or train in a way that you wouldn’t or couldn’t, perhaps because of their physical attributes alone. These less well-suited clinicians, while still potentially very successful, talented, or helpful for some, are not going to be the right fit to help you take the pieces and plug them into your own training program. Plus, if you choose to go to several different clinicians, pick those with a similar training approach and ethic. Going to many clinicians with different styles may give conflicting messages to you and your horse. Instead, find programs that can build upon each other, one to the next. Deborah and her husband Mark have three incredible kids, four horses, five dogs, three cats, numerous fish and a love of family, friends and travel. Deborah is intentional, thoughtful and a consummate professional in whatever she does – parenting, Dressage, painting, photography, quilting, hay farming, law, and “hands on” equine health and wellness care; just to name a few.